Extensive personal experience has brought me to the conclusion that the leg press holds a big potential for building and strengthening the quadriceps and gluteus muscles, which are key areas in maximizing overall size and strength gains. To be perfectly candid, desperation led me to “resort” – a precise characterization of my mental outlook at the time – to the leg press initially. Due to the onset of knee problems, squatting and deadlifting were impossible to pursue regularly or progressively at that time. Refraining from deadlifting was particularly distressing as I had decidedly more natural ability at it. During his serious training days, Smitty had put in a stint or two at this movement and felt that, as an assistance exercise, it could put some usable oomph in the hips and thighs. With nothing to lose, I slowly waded into leg pressing. When it seemed more agreeable to my knees, I was just thrilled and thankful I could do some form of lower-body work again on a regular basis. The fact, however, that the leg press proved a grand discovery in my circumstance DOES NOT automatically earn it a spot in my “highly recommended” list for everyone. But the fact that Smitty’s contention about the leg press bore out, did get my attention in a big way. It had been at least nine months since I had attempted any kind of pull from the floor, when a couple of lifters in the York gym asked if I was game for some (deficit) deadlifts while standing on a thick board. This is a somewhat obscure movement in the Olympic lifter’s repertoire, but it’s done so that heavy cleans feel easy coming off the floor. Also, it’s performed a little differently than a normal deadlift. One pulls the bar only to knee height while maintaining an absolutely flat back, holding it at that height for a couple of seconds to make the erector muscles really scream. Since my only preparation for this endeavor was about ten weeks of leg pressing after months of lower-body dormancy, I was worried about aggravating my knee miseries, or, worse, getting a nasty back injury. Ultimately, I succumbed to their pressure, but I went into the challenge determined to be very cautious. When I got to 330½ lbs. (kilo set) for 3 or 4 reps, I was rather surprised. A few sets later, when I did 402½ lbs. for the same reps, I was elated. Although things were going fairly easy and well, I thought I had pushed my luck enough for one day. However, my platform partners kept working up and urged me on as well. I responded, and worked right up to 501½ lbs. Granted, 500 lbs. is not a world-beater weight. In fact I had deadlifted it numerous times before my knee problems began. Nevertheless, I had never tried this much while standing on a board nearly 3” thick. Further, and this held maximum significance in my eyes, this workout was the first deadlifting of any kind I had attempted for nine months. The only hip-leg work I had engaged in prior to the elevated deadlifts was the leg press. And, very importantly, I managed this performance without sustaining much knee pain. Clearly a win-win situation in my mind. Iron Game history vividly shows that some great men had learned of the carryover value from the leg press to the deadlift long before I was even born. Bob Peoples provides a perfect case-in-point. A profiling article about this super deadlifter appeared in the April 1948 issue of Strength & Health. It cited the leg press movement as one of the assistance exercises he practiced to acquire greater overall body power. Note, too, that as of that writing Peoples had recorded an official best of 699 lbs. to the judges’ satisfaction (but eventually went on to do 725). This was as a 182 pounder. In addition, he was capable of deadlifting 450 for 28 consecutive reps, 500 x 17, 600 x 8 an 650 x 4. Incidentally, Bob’s best leg press performance at that juncture was listed at 750 lbs. Going back to the early part of the 20th Century, Hermann Goerner – strongman and deadlifter extraordinaire – liberally engaged in supporting and pressing generous resistance with his feet, while lying. In the interest of full disclosure, it should be acknowledged that he pursued this avenue of hip and leg work to better his proficiency at popular strength feats of his day. These included the “plank,” “human bridge” and the “merry-go-round,” all involving the lifting and supporting of enormous amounts of live weight, typically 20 or more people at a time. Actually, Goerner executed these and many more tests of phenomenal raw power nightly, while he toured with Pagel’s Circus of South Africa. So, leg pressing appears to have served him well. Goerner was rather unique in another respect. Unlike Peoples and legions of subsequent strongmen and lifters, this native of Leipzig, Germany, is reported to have seldom, if ever, engaged in back squatting or any of its variations, a fact noted on page 80 of his biography, “Goerner the Mighty.” According to the book’s author, long-time Goerner confidant, Edgar Mueller, ‘Hermann was not fond of deep knee bending and hardly ever practiced this lift.” Nevertheless, Goerner did perform a front squat with 474½ lbs., which is a good indicator of the carryover value from the leg pressing and deadlifting. As an aside, Goerner did all his feats of strength after World War I with many bits of shrapnel embedded in his legs. As another aside, the full capabilities of Hermann Goerner – as well as Bob Peoples, for that matter – remain vastly under appreciated, and even unknown. In fact, about the only record left of Goerner’s stupendous strength is the previously mentioned book, which I highly recommend to anyone with even a passing interest in physical strength. Goerner, in particular, is one strongman from the past who should command much respect among today’s generation of competitive lifters and general strength training buffs. 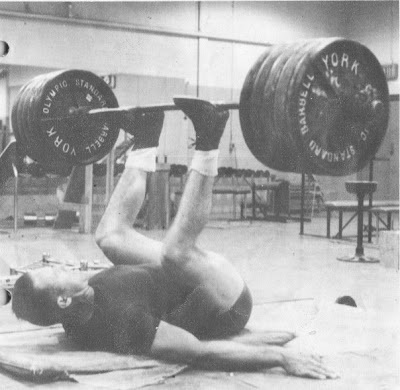 Continuing on with the history lesson, as a repetition developmental exercise, the leg press had visibility in the courses of strength-bodybuilding luminaries dating back to the early part of this century. For example, strongman, instructor and author, George F. Jowett was advocate. 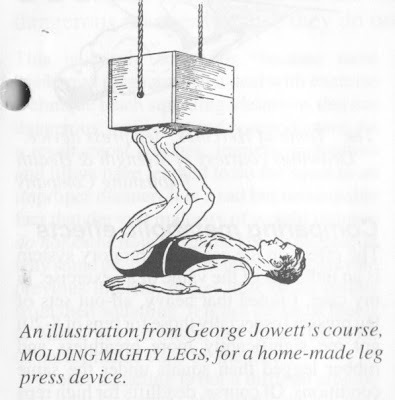 In fact, this exercise was the only heavy-duty, compound-joint, thigh-building movement in his popular train-by-mail booklet (published in 1931) entitled “Molding Mighty Legs”. Further, certain of Mark Berry’s full-length manuals mentioned the leg press, along with flat-footed back squats, deep knee bends on toes, Jefferson lifts, hip lifts and hand-and-thigh lifts, as meritorious leg builders. It is important for those of us today to remember that the advocacy of the leg press predates the actual appearance of machines designed for the practice of this exercise. Hence, those from the 1930s and before who pursued the leg press did so at some risk. Essentially, trainees had two alternatives. First, to rig up some sort of homemade device – such as the arrangement Jowett forwarded in his leg training booklet. This involved securely suspending a box (in which weight was placed) from a rafter. Obviously the right length of chain or rope had to be used so the leg presser could squeeze under the suspended box for the first rep. This arrangement was undoubtedly viewed as a giant step forward for those who purchased the course. The second alternative was to rely on the cooperation of hearty training partners to place a loaded barbell on the soles of the presser’s shoes, and hope his balance was equal to the task. No, I’m not kidding. In retrospect, it’s hard to believe that such a choice wasn’t a causation in preventing the leg press from gaining wider acceptance. Plus, this could also be part of the reason why pumpers rushed to embrace the back squat when its benefits came to light. Despite this, there were more than a few adventurous souls who attempted leg pressing sans apparatus. But they wouldn’t have seen the exercise as “an accident waiting to happen” (as I’m sure the majority of readers now view it). They would have considered their style of leg pressing a more versatile display of strength, supreme balance and dexterity – which, to them, made it a greater accomplishment. Disbelievers, as well as those with unsatisfied curiosity, are directed to a photo which appeared in a 1966 issue of Muscular Development magazine, in a feature profiling powerlifting great, Wilbur miller. This stellar strength competitor was photographed, flat on his back, leg pressing a 500 lb. Olympic barbell balanced on his feet (after spotters put the bar in position). From the aforementioned, one would assume that the leg press was off limits to strength trainees of the early 1900s, if they did not design some sort of rigging, or if they trained alone. Guess again! Even those who trained by themselves found a way to practice the “foot press,” as it was commonly called back then. Unfathomable as it may be to comprehend, lone wolves pulled a barbell of sufficient weight over their heads while lying flat on the floor pressed it to arms’ length, bent their knees toward their chests, and placed the barbell on the soles of their feet. From there, they CAREFULLY extended their legs, did as many reps as permissible before CAREFULLY bringing the knees back to the chest, taking the barbell off their feet, lowering it back over their heads and placing it onto the floor again. Never knew the leg press was a full-body exercise, did you? It’s hard to believe that anyone thought much of a movement at once so precarious and seemingly limited in taxing the muscles of the hips and thighs, but there were muscle celebrities from that era who held the foot press in high regard. Chief among the proponents was revered strongman, handbalancer, gym instructor and physique model, Sig Klein. Klein authored what amounted to an “ode to the foot press” in an article featured in the September 1952 issue of Strength & Health. He simultaneously recalled that it was a mandatory exercise during his youthful training days, and lamented that it had disappeared from the weight man’s repertoire. Incidentally, this stellar 148-pounder expressed pride in his eventually working up to the apparently lofty level of 220 lbs. as an exercise poundage in the foot press. This was a weight he could press overhead in ultra-strict fashion, a tremendous lift for a man of his bodyweight. Klein mentioned, in the same text, his attempt, once upon a time, to revive the foot press among the members of his gym. Alas, the unadulterated, freehand version he so cherished was a big “no sale” with his patrons. However, subsequent attempts at introducing various devices for actual leg pressing were very well received. Klein’s initial creation was a modified “Tome of Hercules” board hinged at the base of the wall, with the top anchored to the wall via a length of chain. A flange attached to the back of the board served to hold weights. 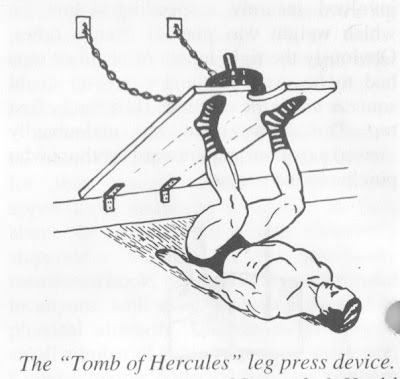 Despite the “Tomb of Hercules”’ out-of-kilter strength curve, being extremely hard to push in the fully contracted position but with the leverage lessening to almost a free ride at the completion, his members flocked to it. In the meantime, ingenuity and persistence drove Klein to perfect upgraded models until he came up with a standard vertical unit complete with a weight carriage and a foot board. 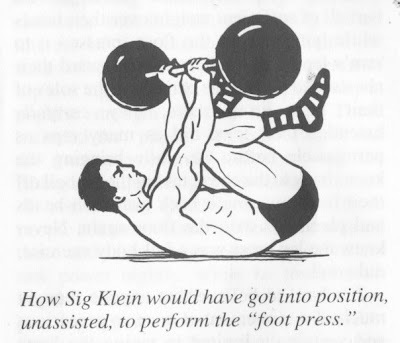 In light of this devotion, it seems safe to assume Sig Klein felt the leg press was a worthwhile exercise. The effect on the cardio-respiratory system is an indicator of the value of an exercise. In my case, I noted that heavy, all-out sets of leg presses (especially those for reps of 8-20) got me significantly more breathless and rubber-legged than squats under the same conditions. Of course, deadlifts for high reps was the ultimate self-torture with a barbell. Proponents of the squat rave on about its metabolic activation properties, and how this triggers growth. If I reach a higher state of stimulation with the leg press (or deadlift) doesn’t this render the alternate exercises to squats better for me? The metabolic activation is what’s supposed to trigger the body’s gaining mechanism. The point is what gets the job done more efficiently. Due to unfavorable leverage (and, later on, injury) I could never reach the poundage in the squat to match the higher level of stimulation reached with the leg press or deadlift. Which exercise, then, should I focus on most of the time? What’s wrong with propitious individualism?